No I didn’t take the above picture. I found it on a Canadian Science blog. I do more than just make drinks 🙂 Sadly, I was not able to find the photographer to give credit. This week has been the week of super storms. I have been lucky enough to just have plain ol’ thunder and lighting and a little hail. My thoughts and best wishes go out to all of the people who have suffered and luckily survived the storms. It is pretty dreary here when I look out my window. Grey skies, muggy dampness. I really want to crawl into bed and watch shows on Hulu. But no, I think if I go to the plant nursery I can talk to all the people who work there. (Of course this is the moment the Hail starts) I decide to quickly assemble dinner. Rainboots on . Check. Off I go. My main reason for growing herbs is that I like to have interesting fresh things around when I create my drinks. I love being able to wander out my door and cut a few stalks and muddle them or soak them in a liquor to get the flavors out. So if you want to follow and plant along I hope this to be an guide. It will make it easier to make my drinks if you have the same basics growing around as well. I didn’t find all the plants I was looking for. I am still on the hunt for a lemongrass and a lemon verbena. I learned at the nursery that this spring the plants are a month behind where they normally are. 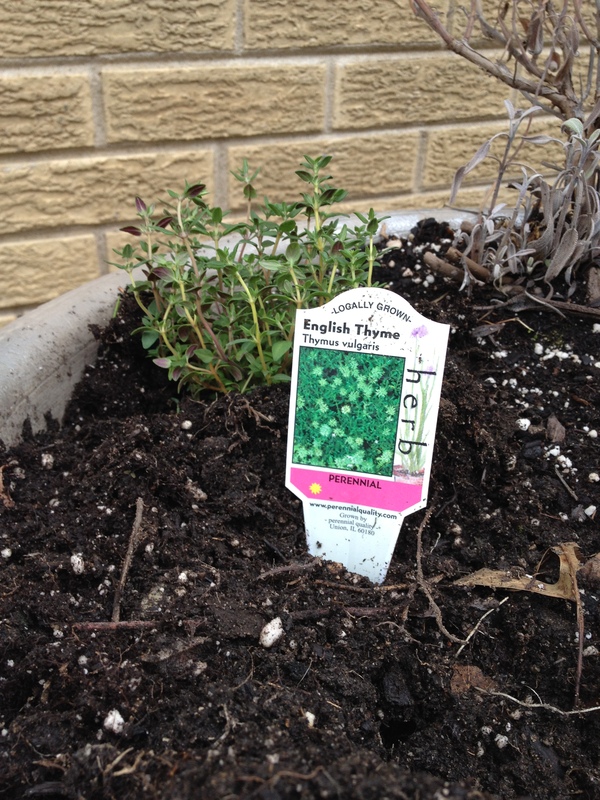 So there is still plenty of time for you to get your herbs in the dirt. I like to plant on rainy days. I figure the cooler weather keeps the plants from going through shock and I don’t have to water for a few days. Here are the new additions to my pots. Thyme. I normally use this on roast chicken and in stews but I have great hopes for it in cocktails this summer. I also picked up 2 types of Basil. 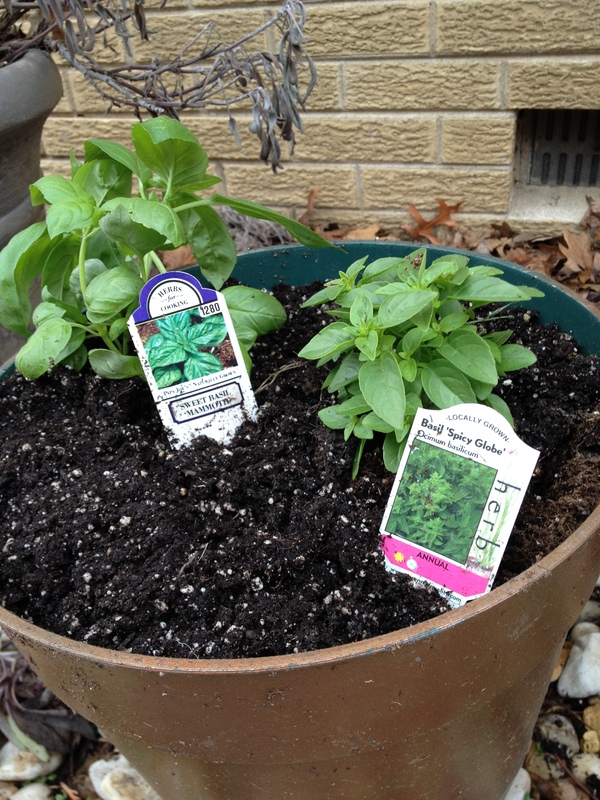 The sweet basil is great for pesto and fresh mozzarella and tomatoes. The Spicy Basil isn’t spicy but a more intense basil flavor. It has a woodier stem, I think it will be hardier outside. I haven’t grown it before so I am curious to see what my preference will be. Side note: See how the Sage in the picture is coming back? The stems are purple and green leaves are forming.. YEA!! 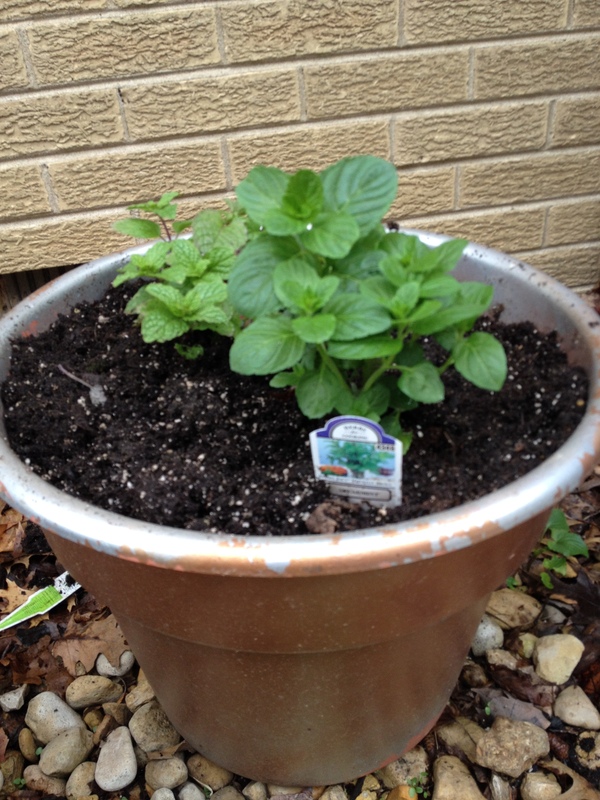 The spearmint is sweeter and sharper than the sweet mint. We will have to experiment to see how much of a difference there is when we make a drink. Soon as the rain stops. I need to spray paint my pots again. They were a plain brown and that was too boring so one can of silver spray paint later. Ta da beauty.. This pot has sat outside for 2 years. The paint lasts awhile. Get your hands dirty planting!! Great things will grow. keep an eye out for Stormy weather the drink!! Previous PostSpring in your stepNext PostStormy Weather the drink.